I live in the south. The southern United States. Georgia, to be exact. I grew up in the north. North midwest. That would be in Michigan. I grew up with snow. We put on snow tires every year. My parents taught me how to drive in icy and snowy conditions. I was used to it. We people of the south are not used to driving in ice and snow. When I first moved here 26 years ago the entire state had only 3 snow removal trucks. We (and I mean we in every sense of the word) aren’t comfortable driving in ice and snow. So, when we hear of The-Storm-of-the-Century-of-the-Week we hunker down. Stay in. But not without first running to the grocery store. Honest. This is a photo (which explains the quality) I took with my cell phone. (But luddite that I am, my daughter had to help me get it from my phone to you all.) 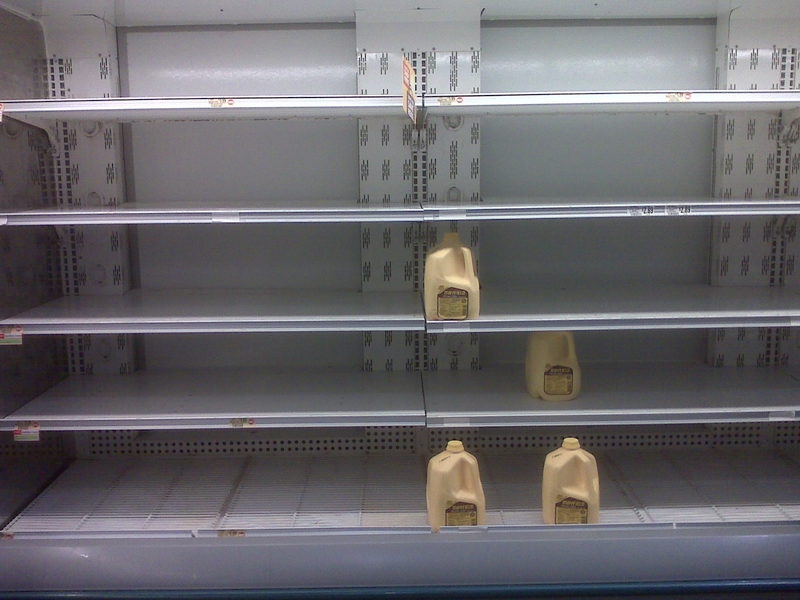 You’d think the meteorologists were predicting the apocalypse and not an ice/snow storm. Another thing I don’t get? Crazies. In Arizona. Shooting government officials because their words don’t make sense. Some nut (who doesn’t deserve the notoriety so I’m not mentioning his name) asked Rep. Gabrielle Giffords, “What is government if words have no meaning?” She had no response. Now six people are dead and 14 are wounded. I’m going to chalk up their decision to speak with a reporter from Dateline, less than 48 hours from when their child died, as a poor lapse of judgement due to shock. They were speaking so calmly, so candidly, I thought they were speaking of an event that happened a year ago. But then Brian Williams kept saying “The events from yesterday” or “Yesterday’s shooting” and I was confused. I admit, I was only watching because I was following the school closings ticker at the bottom of the screen. I hadn’t seen the news because I didn’t sign on to the computer or turn on the television once this whole weekend. (Did I mention I’m a bit of a luddite?) I couldn’t believe the parents of the murdered child were on television instead of grieving or comforting their son or (horror of all horrors for any parent) planning a funeral for their child. I just got the icky feeling (from the mom, anyway) that this was a bit of “15 minutes of fame” and it creeped me out. In a big way. Some days, human nature has me stymied. And this is one of those days.